This vehicle is only availabe for use as a donor in one of our projects. It's not avaialble "as is". This 1972 Toyota Land Cruiser FJ55 is a mostly original example that retains its stock 3.9 liter inline 6-cylinder engine and 3-speed manual transmission. The truck has some rust and body issues but still wears what is believed to be mostly original two-tone paint. The original owners manual is included with the vehicle. In all, it's a very suitable donor for a full frame-off restoration. 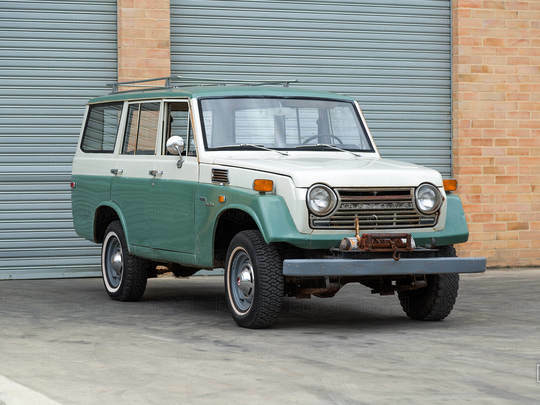 The FJ55, commonly known as the "Iron Pig" was produced from ’67-’80 and was the first true station wagon in the Land Cruiser series, and the first to have fully enclosed box frame members. The 4-door wagon was based on the FJ40’s drivetrain and replaced the 4-door FJ45V(I) with a longer 2700mm wheelbase. Out of all Land Cruiser wagons sold in the US, including the FJ45, it’s the only one that did not come equipped with a hatch and tailgate in the rear, but instead featured a tailgate only with an electrically operated window that can be retracted into the tailgate. This vehicle is not available for sale as-is.